Happy Monday everyone!!! Earlybirds snuck in today, and I’m half way through a book I have been DYING to read (The Idea of You: A Novel) and I’m loving it. I see where all the fanfare comes from. It’s the ultimate romance fantasy (falling in love with a rock star) but it has quite the dilemma… and the writing is fantastic!!! I’m so nervous you guys. I know this one’s gonna hurt! Fox (Stone Cold Fox Trilogy Book 3) by Max Monroe <— MAX MONROE’S LATEST IS LIVE!!! And now the trilogy is complete!! 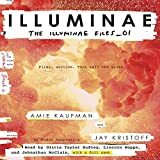 Illuminae: The Illuminae Files, Book 1 by Amie Kaufman & Jay Kristoff <— Cindy loved the audiobook! Cindy: I listened to it on audible. There were lots of sound effects and several narrators. Amazing to listen to…it was intriguing. Good morning! Just found a pre-order by Roya Carmen concerning a troubled marriage and a hall pass! One Week coming out on 6/21–and it’s on pre-order sale for $.99! NAY THAT SOUNDS ALL SORTS OF TROUBLE-MAKING AND I WANNA READ ITTTTTT!!!!! <--- pulling an Ela because this sounds like it deserves a proper Ela reaction. I. CAN'T. WAIT!!! I'm going to be a mess!!!!! Ooooooh Nay, that one sounds good!!!! I so loved The Ground Rules. This Idea of You is such an unforgettable book. It really made me think hard about how society is acceptable of a man dating a much younger women but the same isn’t true for a woman dating a younger man. Sometimes the soul wants what the souls wants! I loved the dialogue. The things that came out of his mouth had me swooning! I think I could relate more to the story because I’m closer to the same age of the heroine. I think I may be one of the few …The Idea of You…loved it until I hated it! Never had a book put me in a bad mood while on vacation at that! Okay now I can’t WAIT!!!!!! I’m already a little furious… you know. Stressed. ”	I loved EVERYTHING about this book. The story, the characters, the romance, the art, the language, the ending. I sent you a LONG email about something through contact a few weeks ago Maryse, could they be going to spam? Everyone else: HIGHLY recommend “The Idea of You” The only bad part overall? It’s her first book. Steph!!! It could be in my spam box, so let me do a search. I wanna read the email!!! LOL! I wonder if it timed-out in the “send process” and is now just floating lonely in cyberspace? Maryse- I STILL have hard feelings against this book. Over a year later!!! But everyone is different and looks for different things. After you are finished, I will explain further. The new CD Reisssssssssss is out tomorrow peoples!!!!! Doing a quickie check-in, fly-by…. still have company, but getting reading time in when I can. I’m on book two of The Darkest Drae & LOVING IT. If you’re a fan of Sarah J Maas, this is up your alley. Hi Maryse, wrote in another link/comment so sorry to repeat but wanted to mention that CD Reiss’ The Edge series Book One, Rough Edge, comes out tomorrow, May 22nd. Cannot wait. The prequel, Cutting Edge, was intense and just pre-ordered Rough Edge. CD Reiss releases before midnight. So, I’m hoping!! Michelle! I’m waiting for June 30th for book three. I do love that series! It was just a whim and totally unexpected to love it as much as I did. A lot of KU choices are whims. 😀 I’m glad someone else is enjoying it. Maybe this way, One of us can remember book three when it comes out. I’d also recommend Kelly St. Clare’s Tainted Accords series. Not as good but still good (does that even make sense?) I think the duo together just bring out the best in each other. I’m on Raye Wagner’s Sphinx series and I for some reason forgot to read book three! Eeek. A new Stephen King, Kooloo????? The blurb sounds really good……..
Maybe I’ll wait till the library gets it in????????? *hugs Jan back* so glad I am not the only one. Give me a HEA any day!